$99.99 $59.99 Scratch & Dent Floor Model! May Have Cosmetic Imperfections & Dirt Marks From Warehouse - Never Used On Horse - Priced Reduced. This is just what you need to keep your horse toasty and warm this winter! Our premium quality Medium/Heavy weight turnout blankets are built to last! 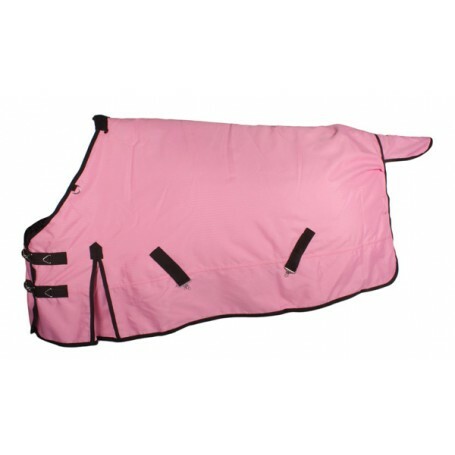 Heavy duty waterproof 600 Denier outer shell and 300 gram poly fill ensure that your horse stays dry and cozy through the most bitter cold. Blanket features a generous shoulder gusset for freedom of movement and double buckle front closure with "easy snap" clips for fast and simple blanketing- even with gloves on!